Former New York Giants second baseman Davey Williams passed away on August 17, 2009 at the age of 81 at his home in Dallas, Texas. 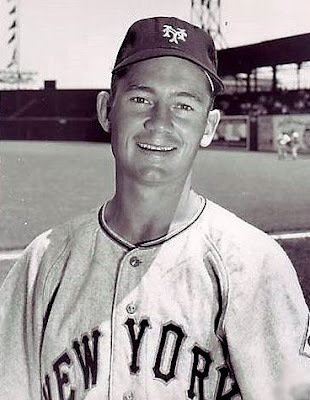 Williams made his debut with the Giants in 1949 and stayed for good after the 1951 season, making the All-Star team in 1953 and appearing in two World Series (1951 and 1954). He had his career ended in 1955 after he suffered a back injury from being run over by Jackie Robinson while covering a bunt. I had the opportunity to interview Davey in December 2008 and he recounted the events of the collision with Robinson. "Jackie was a great competitor. He had the right to get even with alot of guys. Jackie told Howard Cosell that I was the only guy he ever hurt intentionally. I got there late, it was my fault. [Sal] Maglie threw at him. The next pitch, Robinson turned to bunt, and instead of covering first and allowing him to go in and cover the ball on that side of the infield, I'm standing out there waiting for the fight to start. Robinson bunts the ball, and Maglie doesn't go over to field the ball, Whitey [Lockman] goes over to field the ball, and now I wake up and have to cover first base. I got there the minute he got there, and I didn't have any momentum going for me at all, and he ran right up the middle. Somehow, I held onto the ball, he didn't knock it out of my hand. I was out too, I didn't play again for 11 days." He had fond memories of playing with Hall of Famer Ray Dandridge in Minneapolis. "He had great hands and for the life of me, I don't know why he didn't get a chance to play in the big leagues. He was impressive." During the same time he was there with Dandridge, Willie Mays was making his debut in Minneapolis. After briefly playing with Mays, he knew that Mays, "would be a franchise player somewhere." Definitively, Williams described Mays as, "the best player I ever saw." With the National League up 2-0 in the 7th inning, manager Charlie Dressen inserted Williams into the 1953 All-Star game, replacing Red Schoendienst. Williams told the story of his brief appearance in the contest. "I caught the last out in the All-Star game off of a pop-up from Yogi Berra. I always told people if I dropped the ball, we could've padded the score; heck we might still be playing! I got to bat off of Mike Garcia. I went up to hit against him in the 8th inning, and he threw the first pitch, and I thought, 'Whoa! My gosh!' He surprised the heck out of me, he threw a fastball. I hit against him a hundred times before and he really startled me when he threw that first pitch in the All-Star game. It was kinda like he threw it 110 MPH. It wasn't that way in the World Series a year later. I wasn't that surprised [regarding their meeting in the 1954 World Series]. I hit the ball out of the ballpark against him and it was foul by about a foot. I was around by second base and I come back across the mound, and Mike said, 'I must have made that a bit too good.' I said, 'You must have if I hit it that well.'" I was sorry to learn of the passing of Davey Williams only today, July 4, 2010. As a young boy playing stickball back in 1954, I would announce each at bat. "Leading off, Davey Williams; batting second, Alvin Dark; up third, Willie Mays," etc. Davey's name just had some of that special childhood ring to it that helped to make him one of my favorites of the Giants in the 50's. As I learn of the passing of these boyhood baseball heroes of mine, it especially effects me. Giant baseball was such an important part of my childhood. Awe.....so you knew my biological Grandpa?? ?